Today, thanks to a recent order from HB Beauty Bar, I've got one of the latest polishes from new-to-me brand Morgan Taylor! From the Cinderella Collection... Watch Your Step, Sister! 3 Coats Morgan Taylor Watch Your Step, Sister! I saw a few posts about the collection, and this gorgeous pink creme stuck in my mind. 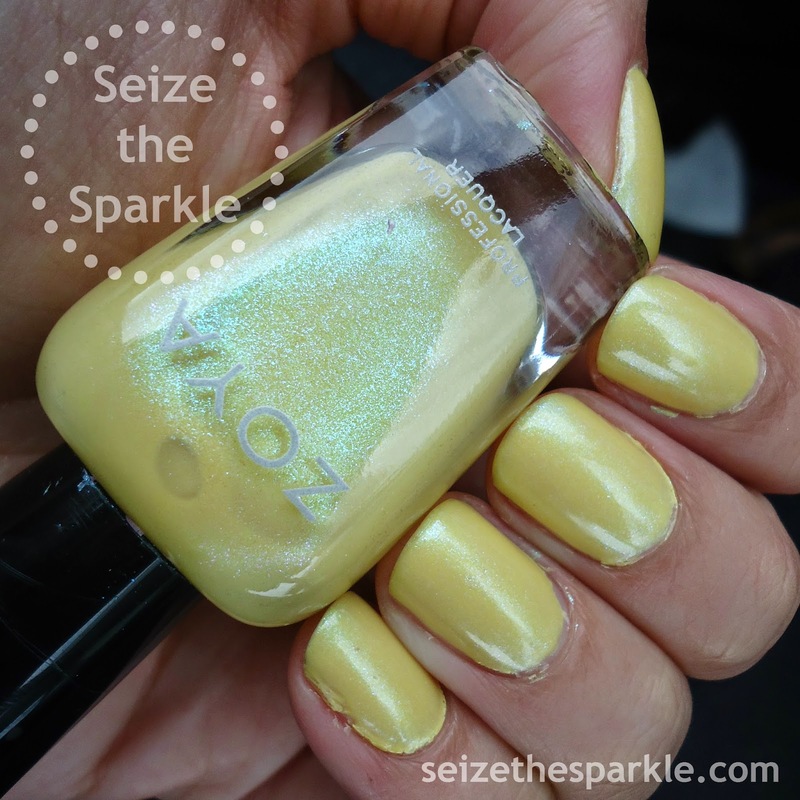 So, when I was going a little nuts ordering polishes from HB Beauty, I thought it would be the perfect time to throw in a bottle and try out the brand. Watch Your Step, Sister is a really punchy mid-toned pink. I seriously love this shade of pink. It's got a little hint of coral to it, but only enough to warm it up. Thankfully, it's nothing that takes it over into actual coral/peach/orange territory. The formula on this polish was a little thicker than what I'm used to. Application was good, once I got the hang of the brush. It's a little thicker than I'm used to, so I had a little flooding on the first go around and had to start over. The brush holds a lot of polish, so I found that a light hand worked better. I also tried to make sure to have as little extra polish on the brush stem as I could. For my photos... I used 3 coats and still had a little patchiness. Nothing that 2 coats of clear couldn't handle, though. This polish settles nicely, which I figured it would. Thicker polishes usually do. Overall, I really like this mani. The color is perfect for both Spring and Summer, and should work nicely with Escar-Go To France, once it comes out! For now though, I'm really hoping the prompt I pull tonight will work with Watch Your Step, Sister for Fishbowl Friday Numero 26. We'll see, we'll see! On Friday night, Peanut and I went on a fun mommy/daughter date to a local planetarium. Sparklegirl was absolutely mesmerized by the presentation, and practically ran a full commentary during the entire thing, too. I think she's following in her mama's chatty footsteps. My mom has always told me that I talked nonstop when I was a kiddo... so I can't say I ever expected anything less. It is seriously the awesomest thing... watching little Sparklegirl discover new things with such a level of enthusiasm. I wish I could bottle her effervescence. It's soooo refreshing. We've been talking a lot about the visit since then, so the planets, moon, and stars have been on my mind a lot. Last night, I quickly decided on blue as the main color for my nails. This celestial seriotype just sort of bloomed out of that. 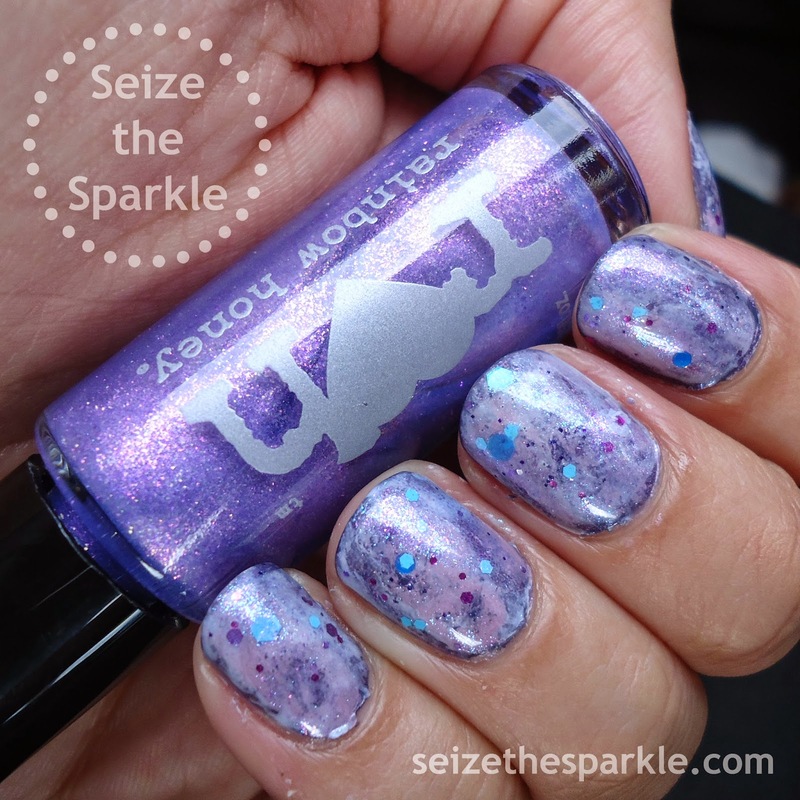 It's a glittery, seriotype take on galaxy nails and I'm seriously loving it! And while we're on the topic of things I love... Sally Girl Trapeze Artist, guys. It's got such a pretty mix of colors and glitters, I really need to pick up a couple more bottles. I wish it came in a full-size bottle rather than the minis. But the price point is awesome at .99/bottle. Soooooo, I really can't complain that much. But I definitely need more. Lots more. When I bought Cruisin'... it actually wasn't for me. I bought it for Peanut so I'd have a quicker-drying super pigmented polish for her little nails. But last night, something about this shade was just calling my name. So, on the nails it went. Sorry kid! Cruisin' is one of Sally Hansen's Limited Edition shades for Spring 2015. I picked mine up at Rite-Aid a while ago, but they haven't been changing out displays like they used to, so it might still be in stock! PR materials from Coty describe this shade as a "pink sherbet," and that's pretty accurate. Which is weird, because I see coral when I look at the bottle. It's definitely more of a peachy pink color on the nails! 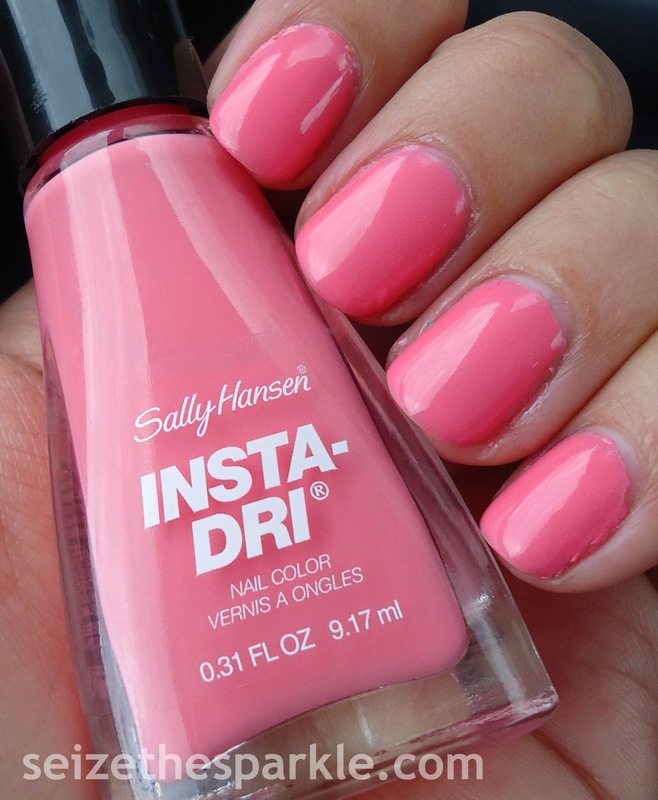 It's been a while since I've used a Sally Hansen polish, and I think this might be the first Insta-Dri on this blog! Definitely a different experience with the brush. Not bad or anything, just different. It takes some getting used to the length of the brush handle and the size of the brush. The brush is a little smaller than the Wet n Wild ManiCurve, but still curved a bit at the edges to help prevent flooding. The handle is longer than what I'm used to as well, and definitely carries a lot of polish on it if you're not careful. Once I got the hang of the brush, it did take 4 coats to get my nails to opacity. The formula was really nice, though. 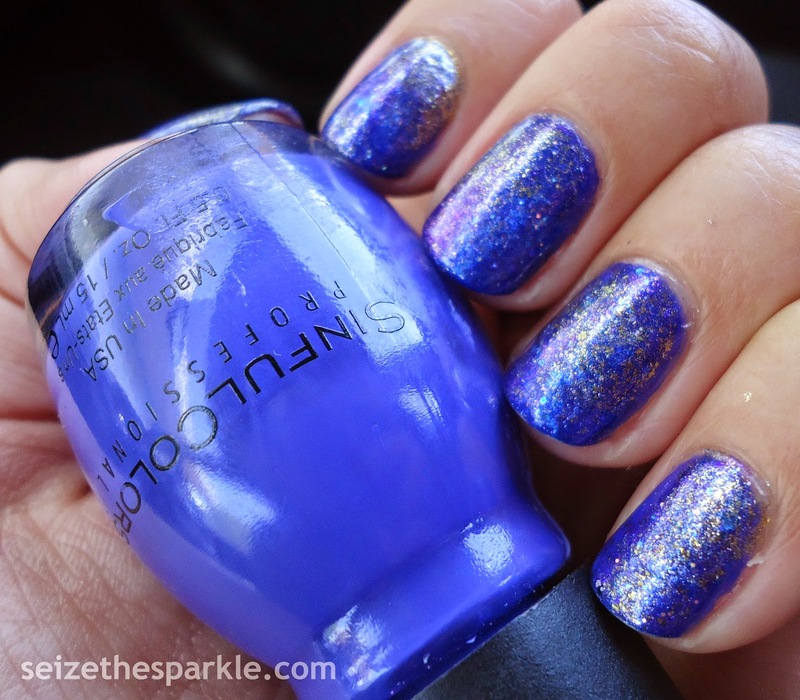 The Insta-Dri line was recently reformulated, and I was pleasantly surprised by the level of workability. The last Insta Dri polish I tried dried almost too quickly. With Cruisin', I wasn't mucking up my last coat when I went around for the 2nd, 3rd, and 4th time. Also, there was a whole lot of shine going on with each coat of Cruisin'. I definitely noticed how shiny it was on application, and how shiny it stayed! 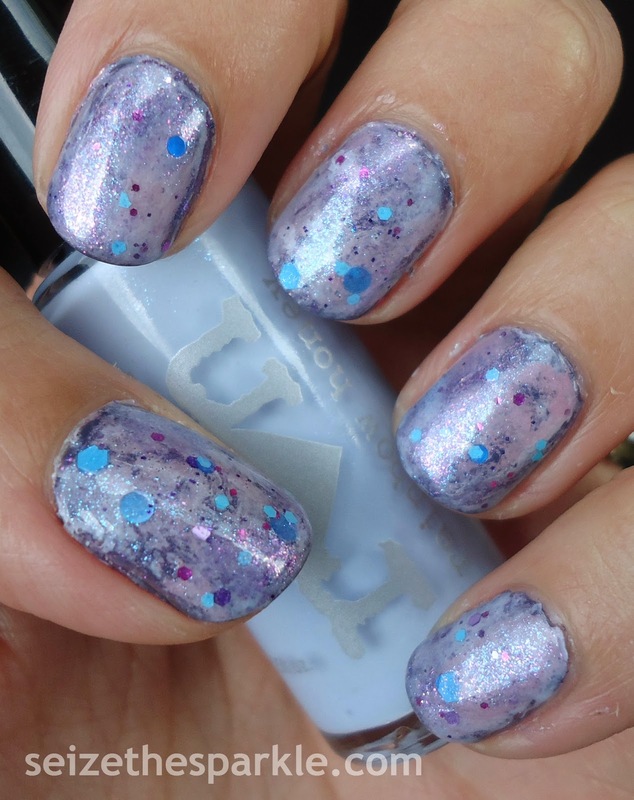 Since I paint before bed, I'd never trust skipping topcoat and Seche, but this formula certainly made me feel like I could! When I picked this shade out last night, I definitely was looking for something warm and summery. You know, the longer I wear it... the more it grows on me! I think it would be a supercute base for nail art, and I love the fact that it's so bright, despite being a mid-toned pastel. Aaaaannnnd I'm thinking it will look even better come summer when I've got a little more of a tan going on! I'm not sure how it's taken me this long to pick up SinfulColors Energetic Red. 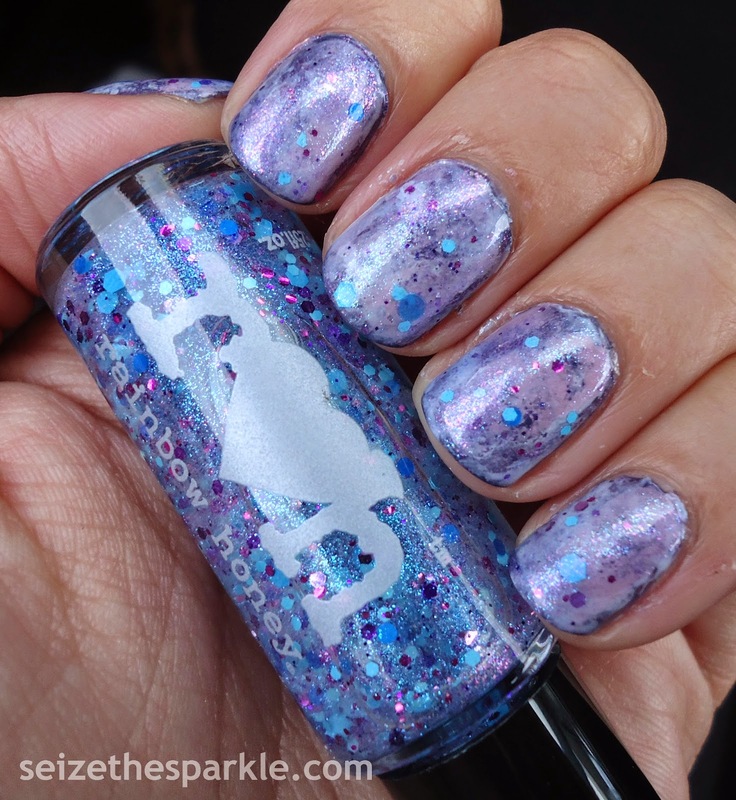 I own more SinfulColors polishes than any other brand, and it surprised me to find this at Target, read the name, and realize it wasn't in the sparklestash. Yoink! I can't say that I'm much of a red polish kind of girl, but when I do wear red, it tends to be of this variety. Reds that fall in the poppy/tomatoey range really catch my eye. Energetic Red reminds me a lot of another fave red, and has possibly trumped it! This one is brighter, with a smidge more orange. Which is surprising considering my feelings on that particular color. As much as I like this shade, I can't say if I'll keep it on for another day, turn it into nail art, or paint on an entirely different color. That's a story for tomorrow... Happy Monday! 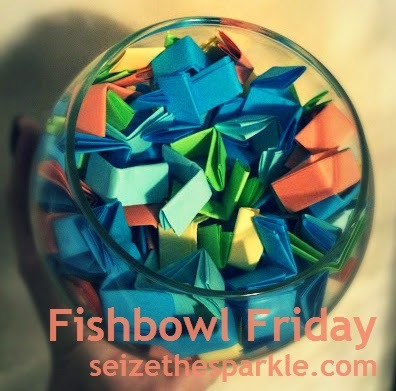 Waaaaay back when I was planning Fishbowl Friday and coming up with prompts, I thought it would be fun to add a couple of brand prompts into the bowl. I tried to make them brands that I had a good amount of polish from, so this one surprised me a little. Back to Reality... TV is one of only 9 polishes I own in the Nicole by OPI line. I haven't bought one in a while, and it's a brand that's really fallen under my radar. How does that happen? Well, the display is definitely tucked pretty far back at my local CVS. And that same store still has the Seize the Summer display out from last year, so I'm not even sure they're turning over stock like they should be. I don't remember seeing the Coca-Cola Collection stock there, now that I think about it. Weird. Regardless, I'm glad I included it in the list of prompts, and I'm really glad I pulled it. Like I said, it's been a while since I wore a Nicole by OPI polish, and I forgot how much I loooooove this shade! Back to Reality... TV was part of the Kardashian Collection for Spring 2012. 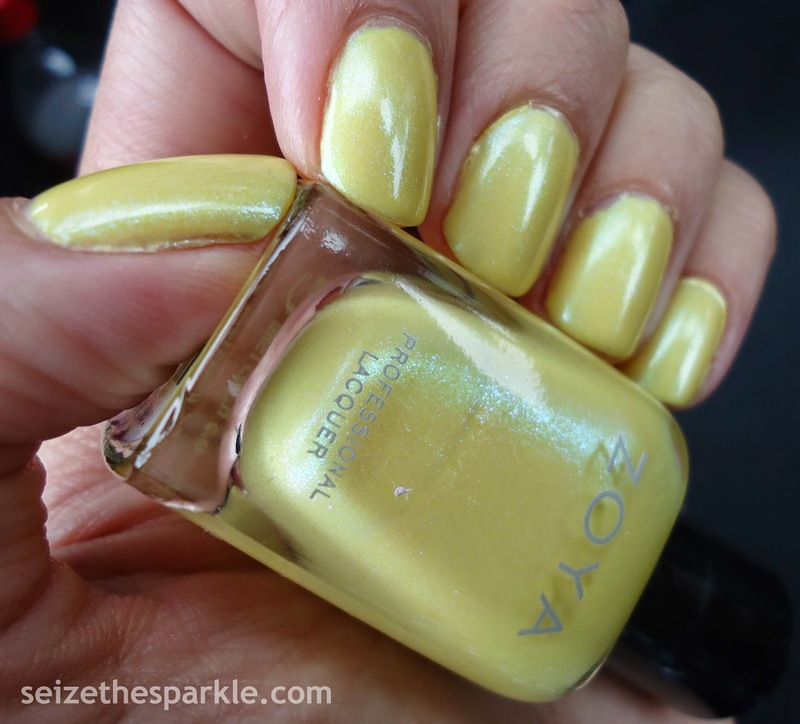 I remember swatching this for my old blog Polish & Prose, but it never quite made the transition over here. At the time, red shimmer was a thing, kind of like how right now, turquoise shimmer is a thing. Back to Reality... TV is a dusty, muted periwinkle crelly with a fine red shimmer running through it. It's a really pretty color, and great for Spring, even if it did come out 3 years ago! Beware, though... the formula on this is thin. I definitely needed all 4 coats, and probable should've used a 5th. I still see some patchy areas. Other than requiring a lot of layers, Back to Reality... TV went on smoothly and easily. Very nice to work with, and I honestly forgot how nice the Nicole by OPI brushes are to work with! After wearing yellow alllllll day Friday, I was in need of a palate cleanser. Around here... palate cleansing usually comes in the form of the color pink. 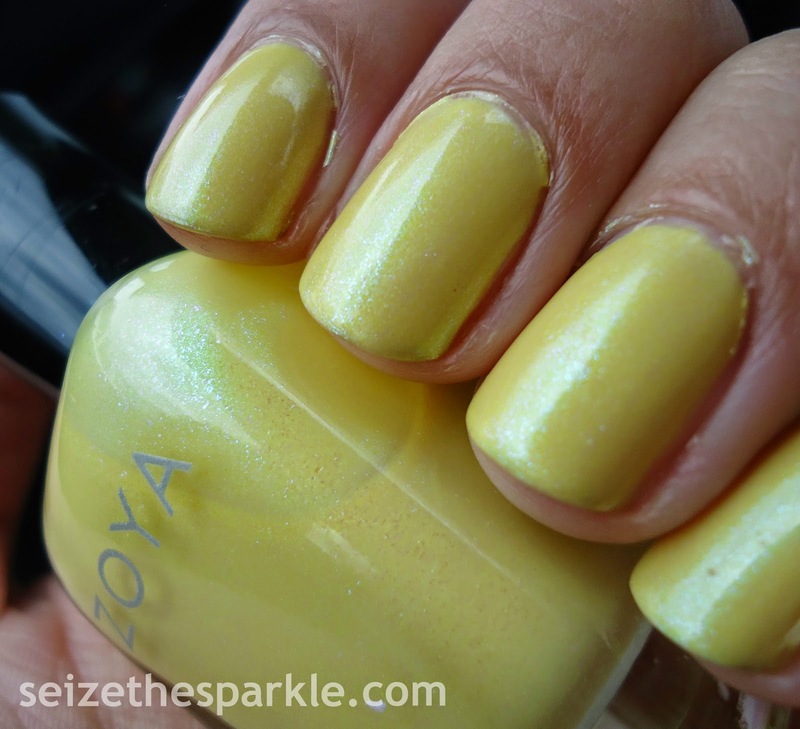 Specifically, Eden from the Zoya Delight Collection. 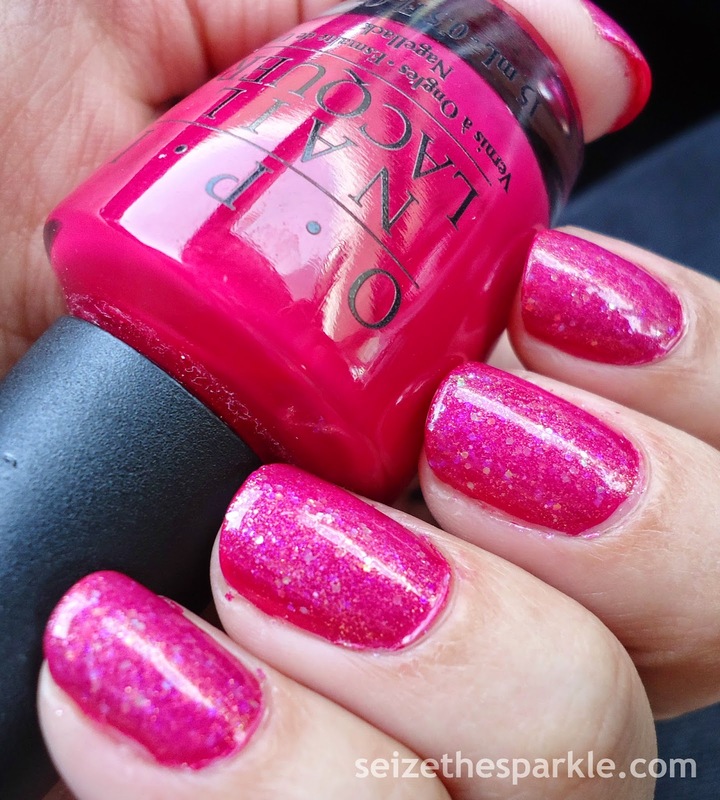 If you're looking for the perfect blue-toned bubble gum pink, Zoya Eden is totally your jam. I sometimes shy away from mid-tone pinks, but I'm loving it on my nails right now. It's pink, springy, flowery, and fun! Formula-wise... this one definitely needed all 4 coats. I still had visible streaks with the 3rd coat, and was skeptical that the 4th would even out. Thankfully, when I added the 1st coat of clear, it helped some of the polish settle down, even more so with the 2nd coat of clear. One coat of Seche Vite and I was good to go. So... I actually wore this color all weekend long, while painting Peanut's soon-to-be new room. I didn't get a chance to take pics on Saturday before I got her paint all over myself. Then that night I was too tired to paint anything else, much less my nails! Peanut actually entertained me with a shadow puppet show that just wouldn't quit! And after more painting yesterday, my nails were in no condition to be photographed! I painted this mani on fresh last night after Peanut went to bed. Despite wearing it all weekend, I'm still really liking this color. It also has serious potential to be the base for an all pink seriotype. They're forecasting a rainy week, so that usually means my nails will be extra cheery and bright! Allow me to introduce Tree Hugger... a mint green creme from Wet n Wild's Silver Lake Collection. This shade is actually responsible for me lemming the entire collection. I saw it posted on Instagram... Yadi from Night Swatcher previewed the collection with her swatch of Tree Hugger and that was all it took! When it comes to pastel polishes... I'm always wary of streaks and patchiness. At 3 coats, I had visible streaks, so this definitely required a 4th coat. There were still visible streaks when I went to add my layer of clear coat, so I doubled down and put on two coats, which smoothed everything over just fine. One coat of Seche Vite and I was off to dreamland! No idea why she was mad. I can't look at this without laughing! P.S. I've still yet to find the Spoiled counterparts of the Silver Lake Collection. Have you seen them?!? 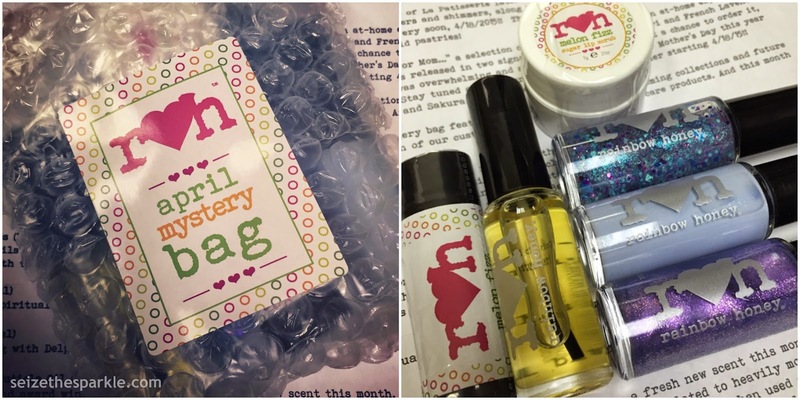 When I opened this month's Rainbow Honey mystery bag... there was a lot of oooooh-ing and ahhhhh-ing over the new shades. Delphine, a cool, pastel blue with turquoise shimmer. 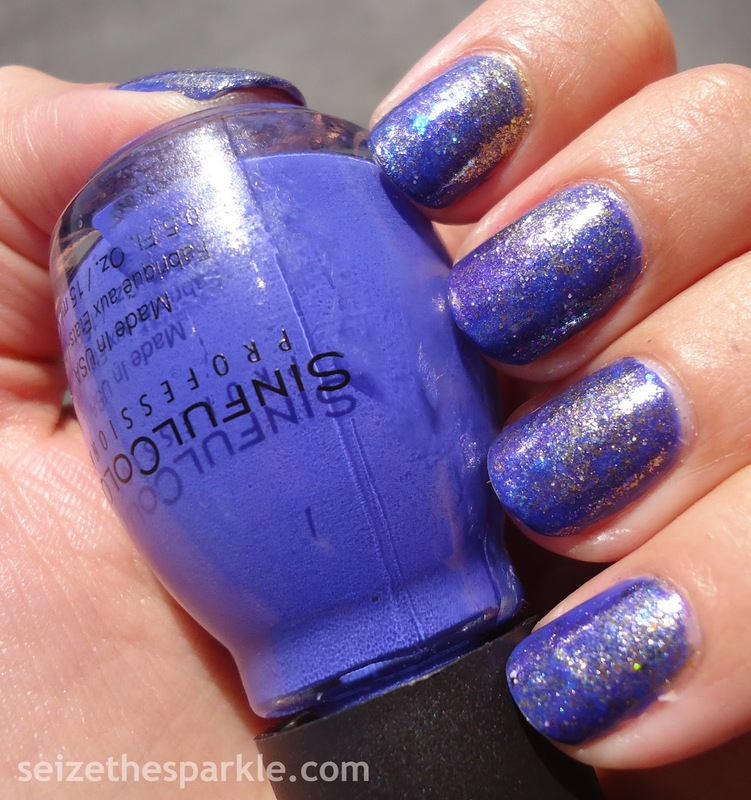 Eidolon, an intense purple shimmer in a lilac jelly base. Then, last but not least, Thistle Tresses, a glitter topper packed with turquoise shimmer, fuschia, pink, purple, light blue, and turquoise hex glitter, and light blue metallic circle glitter. These three were definitely meant to be worn together. Sadly, Tove didn't work as a base for this Seriotype. There just wasn't enough contrast against Delphine. I scrapped that idea, cleaned the polish off my nails, and started over, this time using History of the World from Chian Glaze. It's a darker medium blue shade with a little purple mixed in. After a quick blot of Delphine, I went back and added random splotches of Tempest and Delphine, blotting each time as I went to create a marbled look. When I was happy with the splotchiness of all 10 nails, I moved on to the glitter phase. One coat of Thistle Tresses was followed by random swipes of Eidolon and Thistle Tresses. Two coats of clear coat helped seal everything together, along with a superthick coat of Seche Vite to make sure everything would dry in a decent amount of time. Lots of layers don't have to mean lots of dry time! I definitely like how this mani turned out... but I really wish I would've used saran wrap. It's more pliable and gives you more definition between colors when you're blotting. In all the blotting and mixing, Delphine sort of got swallowed up in the manicure. I honestly might take this off tonight and swatch that one by itself, because it really is such a pretty, cool blue shade. You can never have too many lip balms, especially with a Toddler who will apply/eat an entire tube in one sitting! I think this is my 3rd Lip Balm from Rainbow Honey. The formula is moisturizing yet lightweight, which is definitely a must for the summer months! And if you're wondering how Melon Fizz and Midori compare? Melon Fizz is a little more demure and less sweet than Midori. It's like the honeydew to Midori's cantaloupe if you will. If you like melon scents, you can justify owning both. I haven't tried this yet, but I'm looking forward to it! Same great scent as the Lip Balm. This needs to be a perfume. It reminds me of Summer Juice from last year, but there's also notes that remind me of Incanto Shine, one of my favorite (and sadly discontinued) perfumes by Salvatore Ferragamo. I'm not sure if Rainbow Honey is reformulating Summer Juice into Pomelo or if they've tweaked the recipe and have dubbed it Pomelo. It's sweet and citrusy, but not overly cloying. I'm not sure how Rainbow Honey does it, but they are definitely experts at taking the cloy out of fragrances. When you're scent-sitive like me... that's a huuuuuge comfort knowing that you can wear it without fear of a headache. Oh, and remember how I was telling you about that La Patisserie collection? According to Rainbow Honey's site, it will be available for purchase this Saturday! (April 18th...) No word on a specific time or anything, but we've gotten a little more info on the collection. "10 new gorgeous colors... cremes, glitters, and shimmers accompanied by 3 new amazing scents; Rose Macaron, Petit Four, and Tea Biscuit! Plus, an array of the body care products Rainbow Honey is known for... Available exclusively on rainbowhoney.com 4.18.2015." Should anything change in regards to the release date/time of this collection, I'll update this post as soon as I can. So until then cheries... bisous a bientôt!